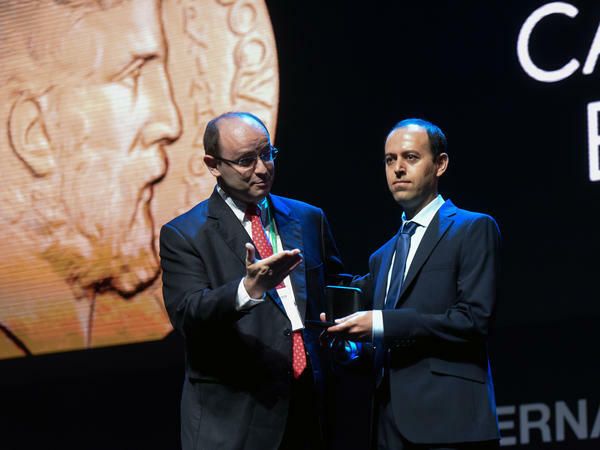 Kurdish mathematician Caucher Birkar (right) received the Fields Medal, math's most prestigious prize, during the International Congress of Mathematicians in Rio de Janeiro on Wednesday. The medal was stolen soon after. Just minutes after Caucher Birkar was given a golden Fields Medal at a ceremony Wednesday in Rio de Janeiro, it vanished. Birkar, a Kurd who fled Iran and became a Cambridge University professor, was one of four people to win the award. "I really want to help people in less privileged locations, countries. ... Especially in the case of Kurds," he said in receiving the award. "And I'm hoping that this news would maybe put a little smile on the lips of these 40 million people." He put the 14-karat gold medal, along with his wallet and cellphone, in a briefcase on a table, according to the O Globo newspaper. A security team later found the briefcase underneath a bench, but only the phone was inside. The awards were announced during the International Congress of Mathematics, which said in a statement that it "profoundly regrets the disappearance of the briefcase" and that it is working with local authorities. Local police have reviewed security tapes from the ceremony and identified two possible suspects, according to Reuters. The medal, which has roughly the diameter of a billiard ball, is worth about $4,200. Birkar received the Fields Medal for making a breakthrough in birational geometry and for his "profound geometric intuition," according to a write-up on the website of the International Mathematical Union, which selects the committee of judges. He was born to farmers in a Kurdish village in Iran on the eve of its war with Iraq. "When I was in school [in Iran], it was a chaotic period. ... In many ways, it was not the ideal place for a kid to get interested in something like mathematics," Birkar said. He arrived in the United Kingdom in 2000 and received refugee status a year later. The three other mathematicians honored that day were Alessio Figalli, Peter Scholze and Akshay Venkatesh. First handed out in 1936, the Fields Medal is awarded every four years to, at most, four mathematicians. It includes a cash prize. Maryam Mirzakhani, the first woman to win the Fields Medal in 2014, also came from Iran. She died of breast cancer last year. Wednesday was the first time the event took place in Brazil.